The Cambuslang Harriers group of distance runners of the 1980’s was maybe the best group to come together for the club in the last century. Not one was a Commonwealth, European or Olympic Games athlete; not one dominated any single event in the country, and yet at a time when there were many excellent athletes in competition with them, they won so many team races and collected so many team medals by running for each other and for the club, that they rank up there with the best of them. The club had started performing well as a group in the 1970’s when the Rimmer twins joined the club and Rod Stone, a Northern Irish Internationalist working in Cumbernauld, joined the club to add strength and depth to the squad which contained Robert Anderson, Gordon Eadie and others. At that time I was coaching a group of runners at Coatbridge and after Hugh Forgie of Law & District brought Alex Gilmour along, a good number of men from the club joined the group. Top dogs were Alex and Eddie with Jim Orr, Tom Ulliott, Pat Morris, Sam Wallace and others all of the highest calibre. It will be difficult to separate Alex and Eddie because they were such an inspiring double act – very different people, equally important to the club. Like all top class athletes they were extremely affable, likeable and hard working. Neither went in for posing or prima donna attitudes. Alex came to Cambuslang from Larkhall YMCA as a very promising young athlete; Eddie came from Eastwood High School, via West of Scotland Harriers, joining Cambuslang when West of Scotland went defunct. Alex only had one International vest over the country – New York in 1984 – but was a real hard man to race against and lifted the scalps of all the top men at one time or another: he was always in-and-about team members too, urging them on to work harder, do better. Eddie was a bit more easy going – on the surface. He led by example, no one raced harder, but he had a quiet authoritative demeanour. 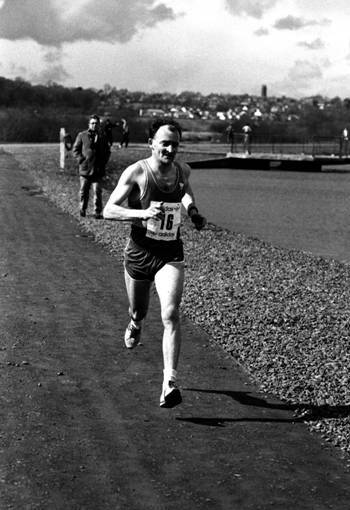 An example of his manner and influence is shown at the time of the New York World Championships when there were four Cambuslang Harriers (himself, Alex, Jim Orr and David McShane) in the team. Eddie had them together the night before the race and pointed out that every country had someone like Nat Muir and every country had someone like Allister Hutton; there were 40 countries taking part, so that was 80 places they could probably forget about! He then discussed the race with them. Eddie only had two cross-country international vests – 1982 and 1984. We can start by looking at their own records before commenting on other club members. (You knew you’d made it when the ‘Sunday Post’ got your name wrong, Hamish McHattie became Hamish McTattie for instance: after the West District Championships one year they were Eric Stewart and Alan Gilmour!) These are necessarily short profiles and are not meant to be totally comprehensive but are here to indicate the quality of the individuals concerned and how they came to be great club men at the start of a remarkable run for Cambuslang Harriers. Several club members are already profiled in some depth on the website and if you click on their name, you will get the profile. They are Gordon Rimmer and Colin Donnelly, . The reasons why any club might do well at any particular period are varied but Dave Thom in his history of the club says that The club’s growing success on all fronts was due to a number of factors: the coaching and encouragement of Robert Anderson, the sound administration from Des Yuill, Jim Scarborough and David Cooney along with his close liaison with the senior athletes, the gritty inspiration of Alex Gilmour, the ever reliability of Eddie Stewart (Steady Eddie), up and coming athletes such as David McShane, Jim Orr and Charlie Thomson and the excellent team spirit which the club was engendering.” We can take five athletes as examples of this spirit, and all five are noted above by Dave. I’ll take Alex Gilmour first simply because he joined the club first – in 1975. Alex did a lot of track running and it was as a track runner that I first saw him in action – an invitation 1500m at East Kilbride – and at the end of his career he had pb’s of 3:54.6 (1500m), 8:05.3 (3000m) and 14:06.53 (5000m) and he was third in the 1985 SAAA 5000m. He had several track international appearances and narrowly missed selection for the Commonwealth Games in 1986. Between 1975 and 1989 he ran in ten Edinburgh to Glasgow races, covering stages 4, 5 and 6 with one fastest time (on Four in 1985) and pocketed one gold, three silver and one bronze. His best run was probably in 1983 when he ran the second stage and moved from tenth to third. But the amazing statistic is that he never, ever lost a place in the event – and picked up a total of 21 places. Of course he ran in the Six Stage as well and in the 80’s picked up a gold, two silvers and a bronze. In the training group Alex was also worth his weight in gold – keeping the recovery jogs up to time, encouraging some, telling others off and reporting back on sessions. In addition to the medals quoted above, he won many of all colours in the Six Stage and Cross-Country Relays plus Lanarkshire Championship and Relays. At a time when his club was starting to get itself together and make a mark on the National scene, Alex was a key man. Eddie Stewart was a tower of strength over the country for Cambuslang adding leadership to the team which was invaluable as well as being reliably one of the best men in the field wherever he turned up. He, inevitably I suppose, had the title of “Steady Eddie”. Surprisingly he only had two International outings – in 1982 and 1984. He turned out as a Junior in 1977 and 1978 for West of Scotland Harriers which was fairly strong with runners such as marathon man Davie Wyper, young Ian Shaw and others but when they shut up shop he joined Cambuslang. His record in the national was outstanding. Let’s put the 1980 to 2002 period (23 years) in tabular form. 1990 19 1st Gold 2002 30 Non Scoring (Team Gold) Last Scoring Runner: 27th! As is to be expected, Eddie had a good record in the Edinburgh to Glasgow in which he raced 13 times, including every race between 1979 and 1989, winning one gold, four silver and one bronze. He covered stages 2, 4, 5 and 6 and performed nobly one every one of them. He ran on the tough second stage five time and picked up 19 places on it, three times picking up four places. Eddie turned out where he was required and raced in the Six Stage Road Relays collecting a gold, two silvers and a bronze. The track was not his favourite surface but he did perform well there too with personal best times of 8:16.5 for 3000m (1985), 14:11.7 for 5000m (1985) and 32:10 for 10000m (1977). It was not unusual to see him using an open graded meeting or a Lanarkshire league match for training purposes running in the 800m, 1500m and 3000m at the same meeting! The 1985 times are of interest for a particular reason. In the National Cross-Country Championships held in February, 1985, Eddie finished seventh but when the team for the international was chosen, he was left out in favour of Colin Hume and Neil Tennant of Edinburgh Southern Harriers, the first of whom finished eleven seconds behind him. The first six and number eighth were selected. It looked like a clear case of bias. Cambuslang Harriers were not prepared to let it go and their ire was the greater because Pat Morris, a promising athlete on all surfaces, finished sixth in the Junior race and was left out in favour of Tom Hanlon (also of Edinburgh Southern Harriers), second in the Youths event. Having gathered the appropriate number of signatures, Cambuslang called an Extraordinary General Meeting of the SCCU with the single item agenda. In Eddie’s case, the Union representatives argued that Hume was younger and had shown more promise for the future than Eddie had. Eddie was just 29 at the time! Pat was fortunate in that there was a call-off in the Junior team so did manage to get to the International. Eddie got a consolation race in Italy later in the year but he was not happy. It takes a lot to rile him and he said nothing at all. But that summer he trained harder than ever, and specifically for the track and improved his times considerably – almost 9 seconds from his 3000m and 11 seconds from his 5000m. He raced more track that summer than usual and picked up many good scalps – he made his point that his improvements were not all behind him. No drama, just quiet determination. It was daft anyway to suggest to the athletics population that they would not improve much after the age of 29! A tower of strength, almost opposite in temperament to Alex, they were very good friends. Eddie moved to live in Prague in 1992 but as can be seen from the table above, returned virtually every year for major competitions and in fact is having a superb veteran athletic career. He won the Scottish Masters championship outright as an M40 in 1998 leading the club to team gold; he won the M45 in 2005 and has also won the M50 title in 2007 and 2011 plus, the latest acquisition, the M55 championship in 2012! . Jim Orr was a Junior who was brought along to our regular Wednesday night training sessions by Alex Gilmour. Like any other young athlete in the club at the time he had been in the shade of David McShane, a quite outstanding young athlete who had won every age group Cross-Country championship from Junior Boy level. When I asked Jim what he wanted to do over the next year his answer was quite clear: “I want to make the Scottish Junior team fro New York next year!” There were a number of Cambuslang runners in the group already and he fitted right in. Jim was a hard worker in training but not a stupid one: if you ask some young athletes to to a particular session they do half as much again on the theory that, if one aspirin is good, three are better! He was also a hard racer and no respecter of reputations. If a big name was having a less-than-good day, Jim would take him or at least have a go. On the country he had won two team gold medals as a junior with David McShane, Charlie Thomson and S Kenny in 1983 and 1984. His first year as a Senior was 1984 and he added to the medal collection with a bronze team award after finishing thirty third. He ran in five senior nationals and won three gold and two bronze medals: individually in ’86 he was eighteenth, in ’87 he was twenty fifth, in in ’88 fourteenth and in 1990 seventeenth. In the four man cross country relay where it was cut-throat competition for the first team, he ran two in the second team but still collected his share of gold and bronze medals. There were also medals in the District and County Championships as well. Did he make the Junior team in ’84? He certainly did with seventh place in the Junior Championship and in the race itself he was sixty fourth and a counting runner for the Scottish team. On the roads he came into the Senior ranks just as the club team for the Edinburgh to Glasgow Relay was coming together and he ran very well in the race. In brief, he ran in eight, won one gold, four silver and one bronze with the fastest time on the eighth stage in 1987 and third fastest on the third in ’83, on the fifth in ’84, on the eighth in ’89 and on the seventh in ’91. Bearing in mind the quality of Scottish distance running at that time, these were very good runs. He was also a good track runner with personal best times of 14:35 for 5000m and 31:21.8 for 10000m, both done in 1985. Charlie Thomson was the same age as Jim and they had run in trophy winning Junior teams together but his career was longer. Charlie has been a familiar figure on the Senior and now veteran scene in Scotland for almost 30 years now and although never an elegant easy striding athlete like some of the track stars, he has had a record of consistency of running at a high level that is probably unrivalled in Scottish endurance running. His collection of team medals is considerable as the table below shows. The totals would have been higher had the competition within Cambuslang been less intense at times – there were occasions when he was inside the the top thirty in the National and not been a counting runner for a winning team, there were times when in the four stage relays he was top man in the second team when the first squad won the race. I have also left out medals won as a Junior or Youth. No District or County Championship or Relay Championship awards have been counted either or the number would have been at least doubled and there were no doubt awards in some of the Classics such as the McAndrew Relays and Nigel Barge races. Charlie was always better on the country and his record of consistency there is quite amazing: in his first twenty years as a senior his placings in the National Cross-Country Championships were as follows: 26, 20, 18, 20, 27, 12, 37, 18, 33, 17, -, 29, 12, 16, 12, 26, 18, 13, 29, 18. Not a Scottish International, his best running came too late for the World Championships, never in the first ten, but – ten times out of 20 inside twentieth position, only two lower than twenty ninth and none at all as low as fortieth! He didn’t do much running on the track but he did have a personal best for the 10000m of 30:53.4. However, as a veteran athlete Charlie was third in the SVHC Championship in 2008 and has won many individual and team awards since then. Finally for this page, David McShane was the man that all the young athletes of the time measured themselves against. Coached by Scottish National Coach Alex Naylor, he had won National Cross Country Championships in every possible age group by the time he started racing with the Seniors: Youths title in 1982, Senior Boys in 1980, and Junior Boys in 1980 and 1981. 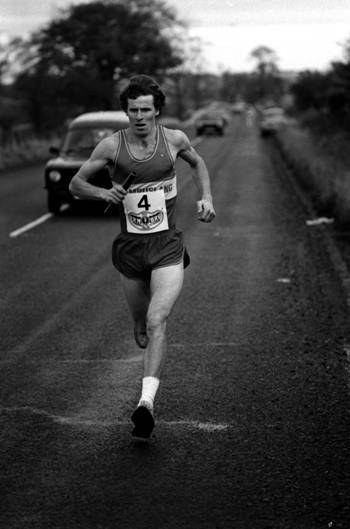 He really was a class act on the country and led club teams including Charlie Thomson and Jim Orr to National cross-country titles and team medals at Youth and Junior age-groups and as an individual was chosen to represent Scotland in the International Cross Country Championships in 1982 and 1984. 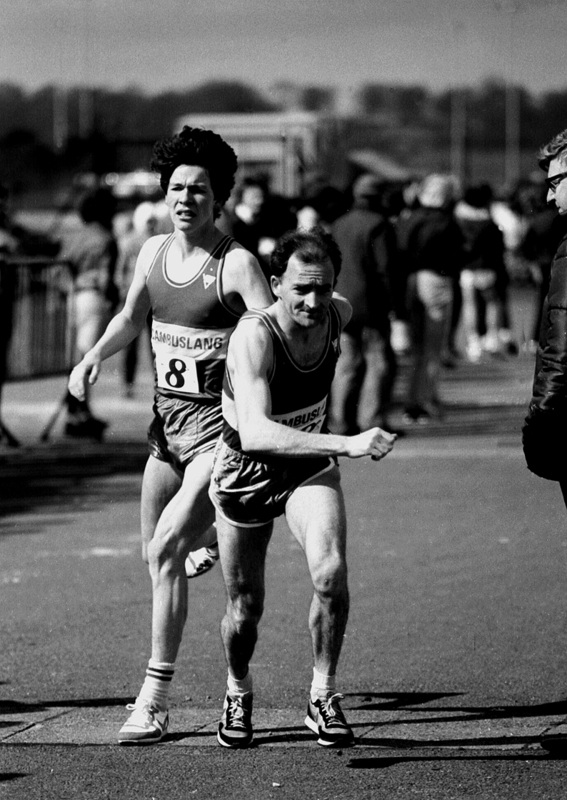 In the Edinburgh to Glasgow Relay, he only ran in three (1985 on Stage Seven; in 1988 on Stage Three when the team was third; and in 1989 on the third leg when the club was second. He also won gold and silver in the National cross-country, the six-stage relays and the four man cross-country championships but his senior career was plagued by injury and he finally retired in 1992. He was one who had played a big part in raising and keeping the team spirit and club morale high during this period when the club was just starting on a prolonged run of success. Dave Thom reported on the events of 1992/93 as follows: “Moving into a new decade, many cynics thought that teh Cambuslang success story would end but, in spite of a number of major setbacks such as the loss of the sterling services of Des Yuill and Jim Scarborough in 1992 and 1993, the sudden death of Andy Beattie in 1992, the retiral through injury of club stalwarts Alex Gilmour, Jim Orr, David McShane, Mark Gormley and Graham Getty, the departure of Eddie Stewart to Prague they were to be proved wrong.” And the club did go on to continue, and maybe in some respects surpass the achievements of the above men with Charlie and Eddie going on into the twenty first century but the actual generation of officials and runners who had started the ball rolling had disbanded. I mean no disrespect to the men who ran throughout the previous years – Gordon Eadie and company would stand comparison with the best of any generation – but the men of the 80’s were special in their own particular way.